Silver leaf and glass pendant light fitting 'Nest' takes influence from nature, birds nests, to be exact elaborate structures that have fascinated us from the beginning of time. The design mixes this organic pattern with a glass distressed inner shade. The addition of the silver leaf finish brings a chic contemporary look. Metallics and surface detail is 'on trend' for interior design with this new luxury silver leaf effect being the latest available for 2016. 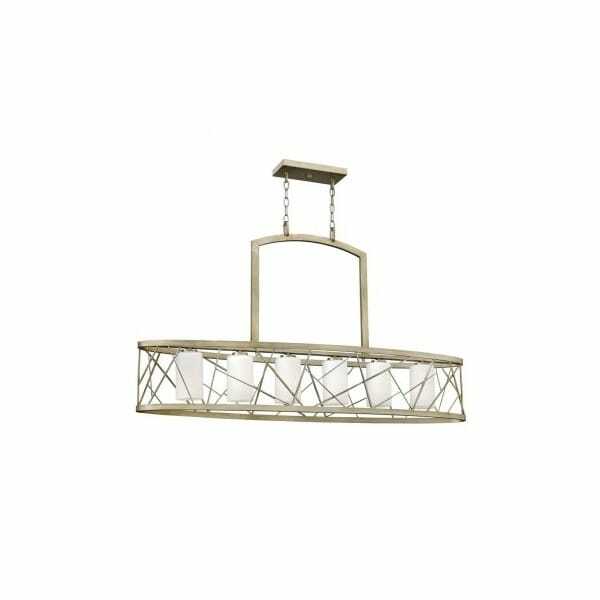 This oval long light is great for lighting table or kitchen island. This being the longer of the 2 linear designs availble in the range. The entire 'Nest' range has a long drop, you can use multiple fittings to create a staggered effect which looks very bespoke for very large spaces such as hotel foyers reception area's. Other Features: Supplied with 3048mm of chain.